A New Look: Could Breast CT Surpass 2D Mammography or Digital Breast Tomosynthesis for Screening? About one in eight women in the United States will develop breast cancer in her lifetime if she lives to be 80 years old, according to the American Cancer Society. When detected early, however, many breast cancers can be successfully treated. So, what is the best screening exam for breast cancer? Two-dimensional mammography remains the gold standard. According to the National Cancer Institute, the mortality rate from breast cancer for women ages 40–74 has dropped 15% to 20% since 1990, thanks to more women having annual 2D screening mammograms. Digital breast tomosynthesis (DBT) was introduced in 2011 and approved by the FDA for breast cancer screening and diagnosis. Many believe that tomosynthesis, a pseudo-3D imaging modality similar to mammography, can better find and characterize suspicious lesions, especially in women whose breasts have more dense tissue than fatty tissue. DBT has recently become more widely available. Ultrasound and MRI with contrast are also used for breast cancer screening and diagnostics. Now, researchers at the University of California (UC), Davis are building a novel, dedicated breast CT scanner that they believe has greater potential to improve breast cancer detection and diagnosis than any of these other modalities, including DBT and MRI with contrast. "From studies we have done so far, I can tell you that breast CT with contrast is by leaps and bounds better than 2D mammography and tomosynthesis," says Shadi Aminololama-Shakeri, MD, an associate professor and chief of the breast imaging section in the department of radiology at UC Davis School of Medicine. "Our results from preliminary studies show that dedicated breast CT scanning is significantly better than 2D mammography for finding breast masses that turn out to be malignant," adds John Boone, PhD, a professor of radiology and biomedical engineering at the UC Davis Medical Center and a member of the UC Davis Comprehensive Cancer Center. However, breast imaging expert Etta D. Pisano, MD, professor in residence at Beth Israel Deaconess Medical Center at Harvard Medical School, says she needs to see more clinical data before she could say breast CT's value for screening is extremely high. "If you believe that 3D has benefit for breast cancer screening, it would make sense that a true 3D system would be valuable," Pisano says. "But I have a very high bar to say it should be adopted in clinical practice, and I haven't seen enough data. We're not there yet." The UC Davis researchers say the key to their breast CT scanner is that it provides true 3D views. "Whereas 2D mammography is just looking at the breast in two dimensions, and tomosynthesis is quasi-3D, not true 3D imaging of the breast, this is," Aminololama-Shakeri says. "With our scanner, you can look at the breast in all three coordinate systems and see true coronal and axial resolution in high definition," Boone adds. Another advantage to the researchers' CT scanning technology is that it does not require compression of the breast; in 2D mammography and DBT, a woman's breast is compressed to collect the images with low-dose radiation. With UC Davis' breast CT, the patient lies facedown on a padded table and places her breast in a circular opening. The scanner generates 300 to 500 images as it circles the breast—a complete 360°. The images are then assembled into a 3D digital image. Imaging with the 3D scanner takes about the same amount of time as mammography—about 10 to 15 seconds for each breast, Boone says. "There is some radiation dose associated with breast CT but, with our scanner, it is equivalent to 2D mammography," he says. Because their breasts aren't compressed, women are more comfortable with the exam, Boone says. Women often cite discomfort as a reason for avoiding regular mammograms. A survey of 10,000 women by the market research company Kadence International confirms it: Fear of physical discomfort was the number one reason that women gave for never having gone for screening. "We had a questionnaire that we gave to the first 200 to 300 patients who were scanned on our system, and it was clear that they appreciated the lack of compression," Boone says. "Our scores for comfort were high compared with those for mammography." Ioannis Sechopoulos, PhD, an associate professor of radiology and nuclear medicine at Radboud University Medical Center in the Netherlands, says breast CT is more than a matter of comfort for patients. Breast CT could help eliminate some concerns that can arise from overlapping tissue and that turn out to be false alarms, he says. "Many cancers are hidden by normal breast features that fall on the same place in a mammogram," Sechopoulos says. "This causes early cancer to be missed." Also, he says, several separated normal features could all superimpose in a mammogram, making that area look suspicious. Anytime radiologists aren't confident it's nothing, it "causes women to be called back for additional exams," Sechopoulos says. With 2D mammography, many times, it's "for no good reason," he adds. Larger-breasted women, especially, can be a challenge for the 2D mammographer, Aminololama-Shakeri says. "You have to make sure you get the entire breast imaged and have to tile the images together to make sure you have covered the entire breast," she says, adding that breast CT doesn't have that limitation. The technologist just has to make sure that "all the tissues are in position to be imaged with the CT scanner," Aminololama-Shakeri says. For women with dense breast tissue who are at high risk of breast cancer—those who have around a 20% to 25% chance of developing breast cancer in their lifetime—MRI with contrast is often recommended as a screening technique. Contrast-enhanced breast CT could be an equivalent, Boone says, but breast CT also would be less expensive, quicker, and more comfortable for patients. "The cost of siting a magnet is so huge in comparison with the breast CT scanner that we have," Aminololama-Shakeri says. "With our system, it could mean more scanners are available to more women." With funds from the National Institutes of Health, the UC Davis team has built four prototypes. "We have gone through seven or eight tabletop design changes to optimize the amount of posttissue coverage," Boone says. To date, team members have screened more than 600 women at their institution and at the University of Pittsburgh and conducted a number of trials. In one study published in the European Journal of Radiology in January 2016, the Davis researchers found that contrast-enhanced, dedicated breast CT was able to differentiate between benign and malignant microcalcifications. About 90% of ductal carcinoma in situ is first seen as microcalcifications on mammograms. When followed by biopsy, nearly two-thirds of microcalcifications seen on mammograms turn out to be benign. The researchers studied a total of 42 patients with BI-RADS 4 or 5 microcalcifications. The women were an average age of 55. "Malignant lesions seen on the breast CT were significantly more conspicuous than benign microcalcifications," Boone says. Randomized, blinded, multicentered trials with much larger numbers of participants are still needed, Aminololama-Shakeri notes. In a study published in Medical Physics in December 2012, the researchers compared slice sensitivity profiles (SSP) of the breast from DBT with breast CT. They measured the SSP using brass disks placed within adipose tissue-equivalent breast phantoms. The researchers compared a Hologic DBT system that acquires projection images over a 15° angular range with their breast CT scanner, which acquires images over a 360° angular range. Their results showed that SSP improves when the angular acquisition range is increased. The size of the object also plays a role, as smaller objects have a narrow SSP. The SSP is not significantly dependent on the cone angle, they say. The researchers concluded that object size and angular acquisition range could be overcome once the angular acquisition range is increased beyond 180°, as it is with their system. Boone is leading additional clinical trials to compare noncontrast-enhanced CT with mammography as a screening tool for women at average risk of breast cancer. Sechopoulos says, "[DBT] has proven very beneficial for early detection because it provides us with pseudotomographic imaging of the breast, with a machine that looks and acts very similar to a mammography system. This has the benefit of being very easy to introduce to the clinic." However, DBT does not provide complete 3D information, although it can partially separate the breast tissues so that the effect of superposition is reduced, Sechopoulos says. DBT has been shown to improve detection compared with mammography in several trials, he says, but it remains to be seen how much more benefit "we will get from breast CT."
Still, Sechopoulos believes "the benefit of breast CT is not limited to detection." Breast CT could prove to be highly useful for additional tasks after diagnosis, he says. For example, he expects that it will help physicians verify response to neoadjuvant chemotherapy in women being treated for breast cancer. One disadvantage of breast CT is its footprint. Breast CT systems, for now, take more space than mammography or DBT systems, so this needs to be considered when installing one, Sechopoulos says. Another disadvantage is the amount of information that a breast CT provides. "The large number of slices we get from a breast CT, in the hundreds, could take considerably more time to read for the radiologist than a mammogram or even a [DBT] image," Sechopoulos says. "Fortunately, we have experience with breast MRI to learn from regarding this." Also, if breast CT has so many advantages, why hasn't it been made available before now? A couple of decades ago, one of the medical imaging manufacturers tried to develop it, but the technology was not yet ready, Sechopoulos says. "The type of X-ray detectors needed for this sort of imaging were not available then but are now," he says. Thanks to the development of this technology and others, "this is a very exciting time in breast imaging clinical research," Sechopoulos says. "Since the introduction of digital mammography over a decade ago, many developments have been or are being worked on. [However], a lot of work remains to be done to maximize the benefits of breast CT and other new technologies for the patients." Aminololama-Shakeri says she absolutely can see contrast-enhanced breast CT becoming the standard for diagnostic workups for women with suspected breast cancer. "I see within my lifetime contrast-enhanced breast CT having a real role in at least replacing conventional imaging for diagnostic workups and for screening of high-risk patients," she says. In February 2015, the FDA approved the Koning Breast CT (KBCT) imaging system to diagnose cancer in women who have signs or symptoms of the disease or who have abnormal findings from a standard mammogram. However, the KBCT, developed at the University of Rochester Medical Center in New York, is not intended to be used for breast cancer screening or to replace mammography. Isotropic Imaging Corp, based in Nevada, has a licensing agreement to commercialize the UC Davis breast CT scanner. Boone, who has an ownership stake in that company, expects to have a commercial product available in about three years. 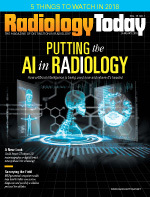 — Beth W. Orenstein, of Northampton, Pennsylvania, is a freelance medical writer and frequent contributor to Radiology Today.